This wooden church was built in 1884 at a cost of $2,000. Mr. A.R. Dennison was the architect. A moving force behind the construction of an island church was The Most Reverend Arthur Sweatman (1834-1909) who later became Lord Bishop of Toronto, Lord Archbishop of Toronto [1907 - 1909], and Primate of All Canada [1907 - 1909]. The island church functioned as the Bishop's chapel-of-ease in the long summer idyll of the last century. Some of Toronto's leading families such as the Masseys and Gooderhams assisted in bringing about the establishment of the church during their summers on Toronto Island. The Bishop's Cottage (which later became the Rectory) was also designed by architect Denison and erected at a cost $3,300 in 1884. It too was out of wood and had the fanciful name of Happy-Go-Lucky. It was located right beside the church. The Bishop was an enthusiastic believer in the rus in urbe life that could be led on the Island. The Bishop's Cottage had a belfry-like tower of open-work beams that crowned the fret-sawn gable. The church architect created a semi-Gothic and Medieval variation on the Stick-Style that was generally used for cottages and summer hotels. Its plan, with chancel and nave, furnishings, and stained-glass-filled windows followed the established patterns of High Victorian parish architecture. [Source: Lost Toronto by William Dendy, 1993 p.49]. 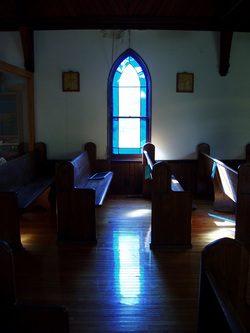 Between 1919 and 1921 large, magnificent stained glass windows were added to the church. These windows were designed and executed by the famous craftsman Robert McCausland. As time passed and the congregation grew, Morning Prayer was started in 1895, with the service of Holy Communion on the first Sunday of the month. Since 1949, the annual Blessing of the Boats is held in the lagoon behind the church. Boats of all sizes and shapes - mostly from the Royal Canadian Yacht and the Queen City Yacht Clubs - come to have their boats blessed by the St. Andrew by-the-Lake rector. In 1959 the church building was moved to its present location. To do so necessitated sawing it into two pieces. This was a tremendous undertaking, accomplished by experts, with no serious damage to the treasured windows. 1875 Regular Sunday services begin in homes of Island summer residents. 1884 Church of St-Andrew-by-the-Lake is registered (as part of the Parish of St. James) by City of Toronto. The church is built on Centre Island (near the present Filtration Plant). First service held on 27 July 1884. 1885 Chancel windows are installed by Robert McCausland and Co.
1895 Church is enlarged by moving chancel back and adding transcept, nearly doubling seating capacity to 210. 1919-1923 Three major stained glass windows are dedicated. The Crucifixion window on the East wall of the Transcept (opposite the organ) is a memorial to the 58 Islanders who gave their lives in the Great War of 1914-1918. 1945 Heating is installed in the church. Housing shortage in City increases the winter population of Island. 1949 The first Yachtsman’s Service is held; organist is Isabelle Gamble, our current organist. A choir association is formed. 1950 St. Andrew is declared a Parish of the Diocese of York. 1952-1953 A Parish Hall is built; it was attached to the church off the current Vestry area. 1959-1961 The church building is moved to its present location. St Rita’s (the Island Catholic church) is also moved to a location near St. Andrew from its original location at 27 Iroquois Avenue on Centre Island. 1959 The original Rectory cottage and the Parish Hall are demolished and the Rector moves to the current Rectory (at the Algonquin Island bridge) which is owned by the Parish from 1960-1968. 1965 Father Paul Hopkins builds a winter chapel in the Rectory. In the room now used as a café, artist William Ronald paints a 100’ mural as decoration for the chapel. The altar now in use at the Church is built by Len Barnett. 1967-1974 Under the leadership of Rev Joseph Abbott, Chaplain of the Mission to Seamen. who lives in the City but commutes to the Island on Sundays, the parish endures a difficult period of turmoil and uncertainty. The parish is reduced to about 15 families. 1975 The church celebrates the centennial of the founding of the parish with a new bell. 1979 The church building is condemned by the City; the order is defied by Islanders who continue using the building for services. 1980-1984 Finally the church is abandoned and services are held in John Fowlie’s Island home. 1984 Under a new agreement with the City, the church building is restored and reopened in time for Toronto’s sesquicentennial and the church centennial. St Rita’s Catholic Church on Centre Island is demolished and the restored church building used by both Catholic and Anglican parishes. 1993 The decades-long period of uncertainty over Island homes is ended with the passage of the Toronto Islands Residential Community Stewardship Act by the provincial legislature. 1996 A second renovation project is carried out with volunteer labour. A new furnace is installed. 1999 The church celebrates the 115th anniversary of the building and the 125th anniversary of the congregation. 2003 The parish, with assistance from the Diocese of Toronto, completes a $40,000 renovation of kitchen and bathroom facilities, and renews the building for the future.